While bordering the popular Chobe National Park, Linyanti Wildlife Reserve outshines with its 308,000 acres of private, unfenced, pristine land with only three small, remote camps. Safari here revolves around wildlife drives by open, custom-built Land Rovers, guided walks in the woodlands, grasslands and through scrub vegetation, night time drives to view nocturnal animals, and off road driving with no one else around. Boating and fishing on the river system adds a great variety. The Linyanti and Kwando Rivers then flow into the Selinda Spillway, harboring over 333,000 private acres of palm-fringed savanna, dry woodlands and the dominating floodplains that connect the water systems of the Linyanti and Okavango Delta. Selinda features only two intimate camps offering morning, afternoon and night wildlife drives by open Land Rovers, great birding, seasonal fishing, and short walks while intermittent between drives or straight from camp. 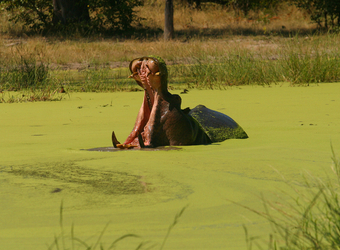 Graced by two-thirds of the famous Savute Channel, the Linyanti boasts an array of aquatic life, water birds and hippo. 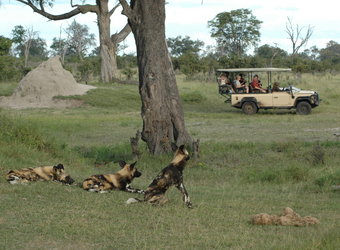 The area is also well-known for endangered wild dog and hosts a large number of predators, from lion and leopard to spotted hyena and cheetah. Most famous for the thousands of elephants that pour in during the dry season, Linyanti showcases plenty of antelope and amazing birdlife. Watch hundreds of bright red carmine bee-eaters flock out of their burrows or see a great number of eagles and raptors along the Savute Channel. 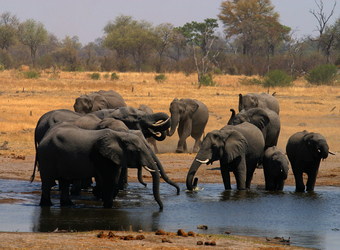 With a similar ecosystem, the adjacent Selinda Reserve offers a greater range of floodplains, attracting huge herds of elephant in the dry season coming to drink from the Zibadianja Lagoon, where the Savute Channel originates. Thousands of other animals are drawn to the spillway, including Burchell’s zebra, blue wildebeest and southern giraffe, and large herds of Cape buffalo. Leopard, cheetah and wild dog are exciting predator sightings, and Selinda has a pride of famous, hippo-hunting lion! Experiencing the river systems and woodlands of Linyanti and floodplains of Selinda creates wonderful contrast to the winding waterways of the Okavango Delta. 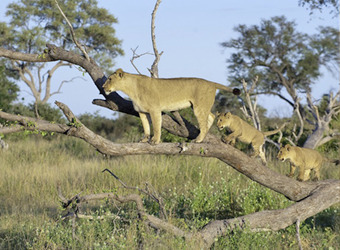 In the green season, these areas should be followed by the open flatness of the Kalahari Desert, speckled with newly arriving herds of impala, oryx, zebra and many other grazing antelopes, followed closely by fierce predators. Possible meerkat sightings add a new element in these desert areas as well. Linyanti and Selinda are very close to Victoria Falls, which can be an excellent way to begin or end a trip to Botswana, seeing one of the most impressive waterfalls in the world and experiencing local wildlife and culture. For an even greater contrast, visit Namibia first with breathtaking deserts of Sossusvlei and Hartmann Valley to the desert-adapted wildlife of Damaraland and Etosha, where you’ll see rhino that you will likely miss in Botswana. When did you visit Linyanti / Savuti Reserves?